Last year I started collecting vintage cookbooks, beginning with those that had graced the shelves of my grandmothers' and mother's kitchens. 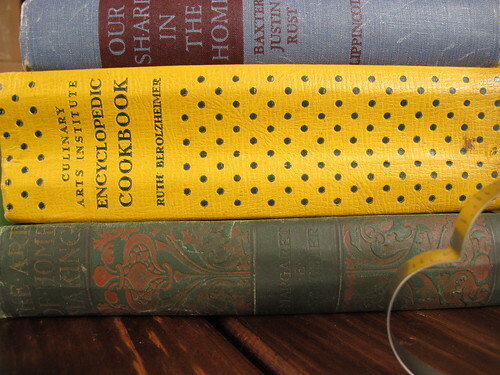 With my shower, an interest in Home Economics books was born. What are your favorite books? Were they passed down to you or did you actively acquire them? Right now, my favorite is a find from 1848, The Art of Home Making, which is signed by the author. Inside the front cover I also found the first owner's name, as well as her daughter and son-in-law's name and date of their marriage when she passed the book on, December 8, 1921. From time to time, I'll be sharing passages that tickle my fancy as I read through these hefty tomes. The following quote struck a nerve with me as much of the focus of Blogging Your Way has been on figuring out who you are and what you want to write about - both now and in the future. "Every home, no matter how simple, holds a place in the hearts and memories of the family members that continues even after they are grown up. For each of us, the members of our family are the ones whose understanding and love mean the most to us. It is important that we understand our families and be able to give satisfaction in our own family group. Perhaps the first step in this direction is to understand ourselves and what we possess by being a member of our own family. Our first problem, then, will deal with ourselves and may be expressed in words one hears often on streets and schoolgrounds: 'Who are you?'"